Much as the limited liability company (LLC) took the country by storm in the early 1990s, forever changing the American landscape of corporate governance and small business taxation, a new type of entity is proliferating from state to state: the protective series LLC. Originally developed in Delaware as a tool for holding different classes of securities in the mutual fund industry under a single umbrella entity to reduce securities filing requirements, a series LLC is a way to cordon off various assets from each other within the same overarching umbrella entity. Each series, analogous to an individual cell performing a function for a larger organism (outside of which it cannot survive), has its own “walls” separating it from the other series. By way of background, the limited liability protections afforded to LLCs – combined with their flexibility and limited (or in Missouri, non-existent) ongoing filing and franchise tax requirements – make them a popular tool for holding property, be it real estate or personal property such as vehicles. This limited liability protection is meant to protect the principals (owners) from being held personally liable in the event of a claim against the LLC, and vice versa. But it can work laterally too, by separating out different assets of the larger enterprise into different entities. As a simplified example, a taxicab company that owns and operates five cabs might wish to keep title to each of those cabs separate and create five different LLCs, plus another parent LLC or corporation to own and operate the five subsidiary LLCs. By doing this, the cab company ensures that the liabilities, debts, and obligations related to one of the cabs (e.g. a judgment from a personal injury case after an accident) do not affect the other cabs or the assets of the parent company. If all five cabs were under the same entity, then all five vehicles could be placed at risk from a single lawsuit and judgment arising out of an accident involving just one of the cabs. By using a series LLC, the cab company could – in theory, if certain requirements are met and each series is internally operated like a separate entity – get the same protection with just one LLC. In this scenario, the parent company would instead be the master series LLC (sometimes called the “mothership”), which would have five series, one owning each cab. Each series could still have the characteristics of a separate LLC, with separate rights, powers, and duties associated with its assets, its own stated business purpose, separate managers, and even separate ownership if, say, the cab company’s ownership wanted certain members to only receive proceeds from one or two of the cabs). If the owners wanted to terminate the existence of just one series because they sold one of the cabs, they could still do so without affecting the other series (although terminating the master LLC would automatically terminate each series). Depending on the state of organization, the cab company could also reduce administrative costs. For instance, in Delaware, state filing fees and annual franchise taxes are the same for a series LLC with unlimited series as they are for one regular LLC, and a series LLC requires just one registered agent for all its series, which could yield savings on professional registered agent fees. Why, then, might using a series LLC not be a good idea? Consider that some practitioners are still wary of using even regular LLCs because of the relative dearth of case law that is inherit in LLCs’ youth. 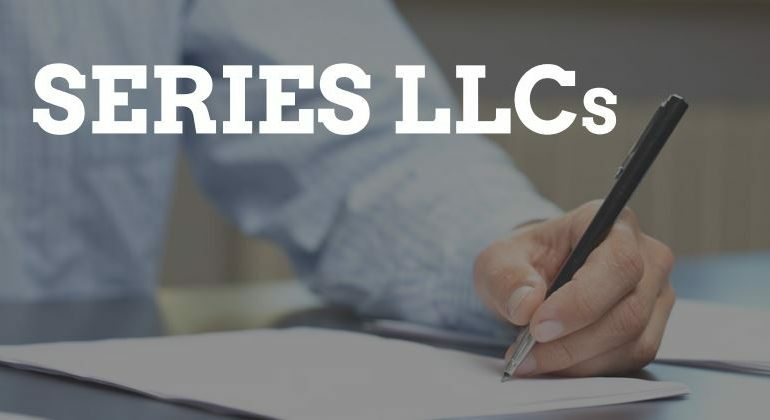 Series LLCs are even younger (Missouri has only had this type of entity since 2013) and are far, far rarer than normal LLCs, which means that in any given state that allows series LLCs, you should expect there is very little case law to which you will be able look for answers. Moreover, while most Midwestern states have adopted some form of this entity, about 2/3 of states nationwide still do not have statutes providing for series LLCs, so if the LLC operates in more than one state, it will often be unclear whether courts in the other states will recognize and abide by the protective barriers of each series within the series LLC. California is one example of a state that does not allow series LLCs to be formed under its laws but will recognize series LLCs formed in other states, but you should not count on every state being so deferential. Similarly, series LLCs vary greatly in how they’re treated across various areas of law, with one of the key distinctions being whether or not state law requires each series to be separately filed and identified with the Secretary of State and whether each series is treated as a separate “person” or entity. For example, Missouri and Illinois statutes specifically provide that each series in a series LLC is a distinct entity that requires registration with the state’s Secretary of State, but Delaware law is silent on entity status and does not require that each series be filed with the Delaware Secretary of State (instead this would merely be provided in the LLC agreement). This distinction has significant implications in areas such as mergers and acquisitions, bankruptcy, taxation, transactions (including secured transactions) under the Uniform Commercial Code, litigation, and more. Moreover, with a series LLC, even the signature block of a contract can become complicated: generally, if the series has no members, the master LLC governs as the signing party, and if the series does have members, the members of that series govern and are the authorized signatories. A master LLC’s operating agreement could provide that its manager is also the manager of each series, but that requires the manager to wear a lot of different hats. In the example above, forming a series LLC would likely be a better alternative in terms of asset protection for the cab company than trying to own and operate each cab under the same LLC or corporation. But in light of the complicated questions that will plague a series LLC through every stage of its existence, the best alternative is likely still the tried-and-true model of having parent and subsidiary companies. While this requires higher initial filing and organization costs, the benefit comes from greater certainty in terms of the enterprise’s treatment by courts, the local secretary of state’s office, and the IRS. For all these reasons, using a series LLC for anything other than passive investments may be more trouble than it’s worth, especially if your business is going to be operating in more than one state. That said, if using a series LLC is something you would like to explore, it is imperative you consult with business attorneys and tax advisors in your state before moving forward. OH MY, MY RELATIVE HAS JUST DIED, WHAT DO I DO?